Jose Mourinho was not on the Chelsea bench for Saturday's defeat at Stoke as he served a one-game stadium ban. Chelsea manager Jose Mourinho still retains the support of Blues owner Roman Abramovich and his position is not under immediate threat. The Blues lost at Stoke on Saturday with Mourinho absent as he served a one-game stadium ban. The defeat was Chelsea's seventh in 12 Premier League games and leaves them three points above the relegation zone in 16th place. Mourinho's side face Norwich at Stamford Bridge on 21 November. The last time Chelsea lost seven of their opening 12 games in a top-flight season was in 1978-79 when they were relegated. 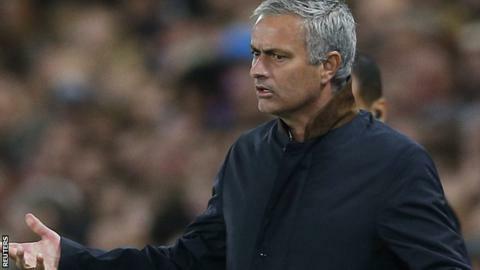 Mourinho, who signed a new four-year contract in August, thanked Abramovich for his support in October following a defeat at home by Southampton. However, since then Chelsea have continued to struggle as they have lost three of their four top flight games and been knocked out of the League Cup on penalties, also at Stoke. Mourinho, who has said the club will have to sack him if they want to get rid of him as he will not resign, has also had his disciplinary problems. The 52-year-old was given a one game stadium ban and fine for his behaviour towards the match officials during Chelsea's 2-1 defeat at West Ham on 24 October. Mourinho also had his appeal against a £50,000 fine and a suspended one-game stadium ban dismissed by the Football Association. The Portuguese received the charge for comments made after his team's defeat by Southampton where he said officials were afraid to award Chelsea a penalty. In addition to his disciplinary problems with the FA, the Portuguese has been criticised for his treatment of former Chelsea doctor Eva Carneiro. Carneiro was dropped from first-team duties after Mourinho said she was "naive" for treating Eden Hazard during the opening-day draw at home to Swansea. She has since left Chelsea and Mourinho is to be the subject of individual legal action from Carneiro, who is also suing the Stamford Bridge club for constructive dismissal.